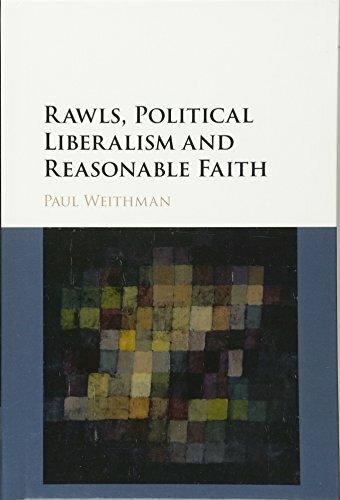 Amazon.com description: Product Description: For over twenty years, Paul Weithman has explored the thought of John Rawls to ask how liberalism can secure the principled allegiance of those people whom Rawls called 'citizens of faith'. This volume brings together ten of his major essays (including one new unpublished essay), which reflect on the task and political character of political philosophy, the ways in which liberalism does and does not privatize religion, the role of liberal legitimacy in Rawls's theory, and the requirements of public reason. The essays reveal Rawls as a thinker deeply engaged with political and existential questions that trouble citizens of faith, and explore how - in firm opposition to political realism - he tries to show that the possibility of liberal democracy and the natural goodness of humanity are objects of reasonable faith. The volume will be of interest to political philosophers, political theorists, moral theologians, and religious ethicists.